There is a growing awareness that international law insufficiently protects common global interests and that States and non-State actors need to work together to protect global aims. 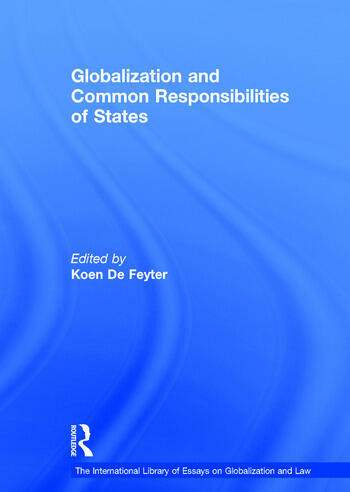 The focus of this book is on the different fields of international law where there is a need for global cooperation to achieve common aims, for example: the law of the sea; protection of world cultural heritage; sustainable development, biological diversity and climate change; human rights; and international crimes. The volume also identifies the legal developments which have taken place, for example treaties which use the language of ’common heritage of mankind’ or ’common concern of humanity’, thereby identifying global concerns and reflecting a global set of values and interests independent of the interests of States. Koen De Feyter is the Chair of International Law at the Law Faculty of the University of Antwerp. He is the spokesperson for the Law and Development research group at the University of Antwerp Law Research School. He is the convenor of an international research network on Localising Human Rights, currently undertaking research in China, India and the DRC. He is the author of Human Rights: Social justice in the age of the market (2005) and World Development Law (2001) and has edited numerous books including The Local Relevance of Human Rights (2011),The Tension between Group Rights and Human Rights (2008) and Out of the Ashes: Reparation for Victims of Gross Violations of Human Rights (2006).